retinitis pigmentosa caused by RPE65. Luxturna was developed by Spark Therapeutics. 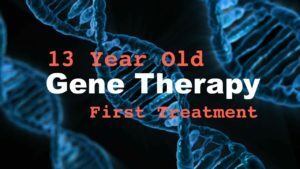 A 13 year old boy with LCA was the first official patient to receive Luxturna after the FDA approval and he had the therapy on March 20, 2018. The treatment was administered at the Massachusetts Eye and Ear Infirmary in Boston. Patients with Leber’s congenital amaurosis lack a normal RPE65 gene which makes a protein responsible for rods and cones to function normally. Defective genes make defective proteins, hence the normal visual cycle can not work because of the lack of “normal” proteins. For a drug to become FDA approved usually takes many years. In October 2017, patients who participated in the Luxturna clinical trials testified before the FDA explaining how the treatment had restored their vision and improved their lives. You may have read that among those who testified was young Christian Guardino from Season 12 of America’s Got Talent. Christian was 13 years old when he received the Luxturna clinical trial. His vision improved 75-80% according to the article. Heretofore, there were no treatments for LCA. The testimonies compelled the FDA to fast-track the approval. Genes are the blueprint for making proteins. Defective genes make defective proteins. In LCA and retinitis pigmentosa (only the variant caused by RPE65), the RPE65 can not make a normal functioning protein. Gene therapy is designed to insert a normal copy of the RPE65 gene into the retinal cells. The normal copy is inserted into the patients’ DNA by use of a specialized virus – a vector able to naturally infiltrate cells and insert the “normal” genetic DNA. Armed with a normal RPE65, normal proteins can now be made which will allow the visual cycle to return yielding an improvement in vision. Luxturna is administered once and may cost about $450,000 per eye. We look forward to seeing you. If you have questions or want to make an appointment, please give us a call.